Blue Ribbon Hall at Best place. Matt Jarosz talks about the Historic Tax Credit program. 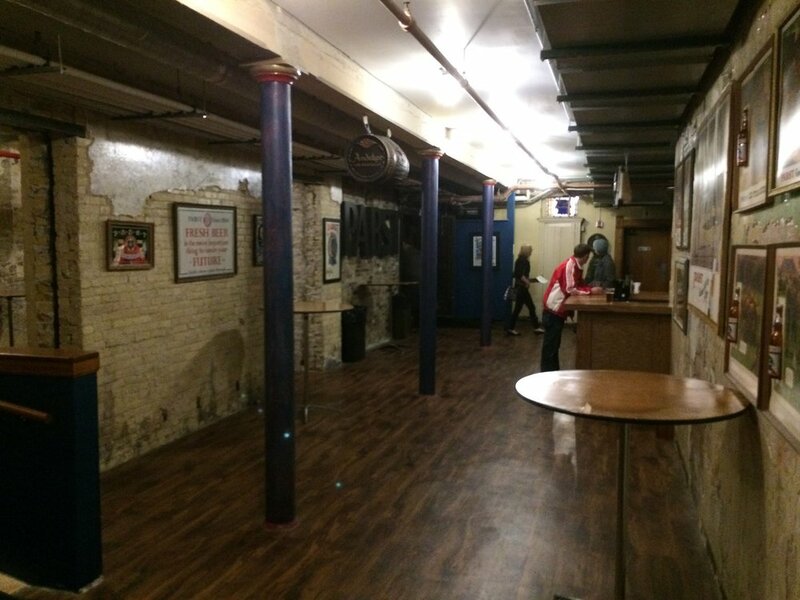 The cavernous speakeasy on the lower level of Best Place. 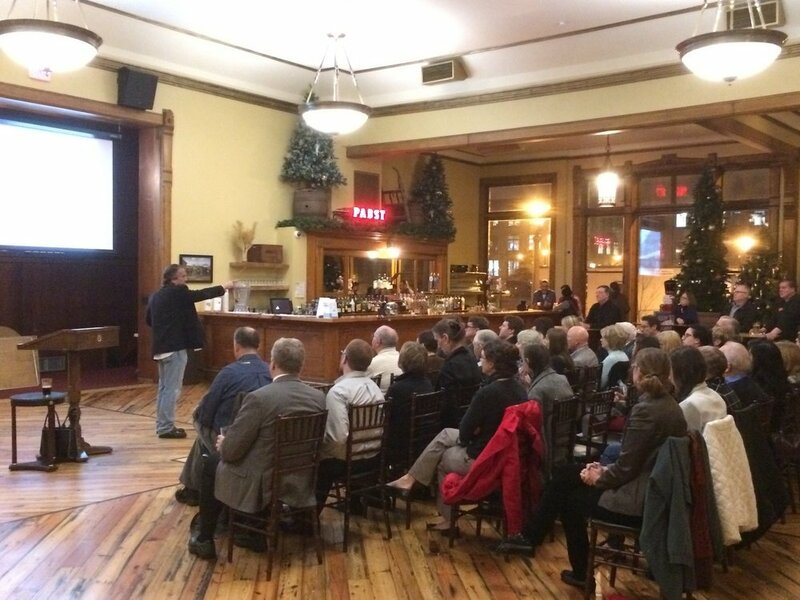 The Wisconsin Trust for Historic Preservation held a social gathering at Best Place at the Historic Pabst Brewery on Tuesday. 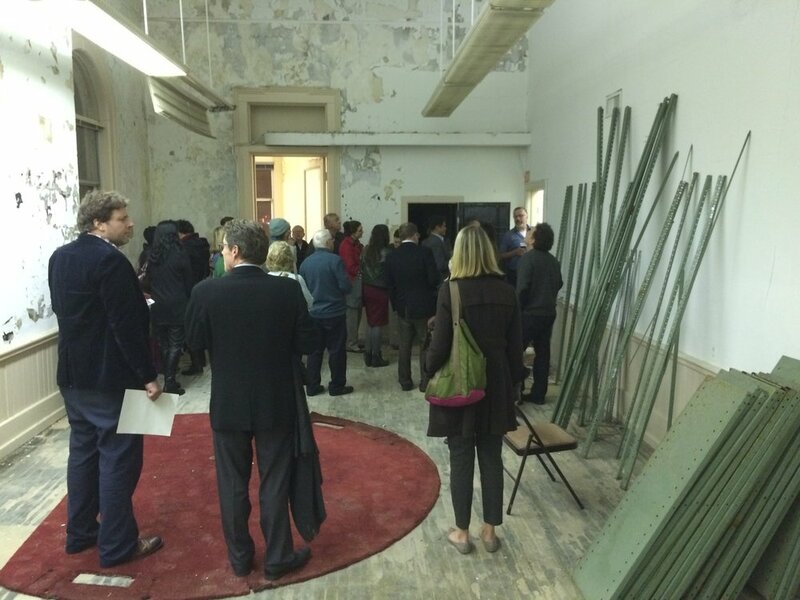 About 40 people came to drink beer, meet new board members, learn about Wisconsin's Historic Tax Credit program, and have a tour of unfinished areas of the massive building with the Jim Haertel, the mastermind behind the rehabilitation. Our new President, Jason Tish talked about recent activities. Board Member, and professor of Architecture and Urban Planning at UWM presented some findings from a recent statewide study of the state Historic Tax Credit program. 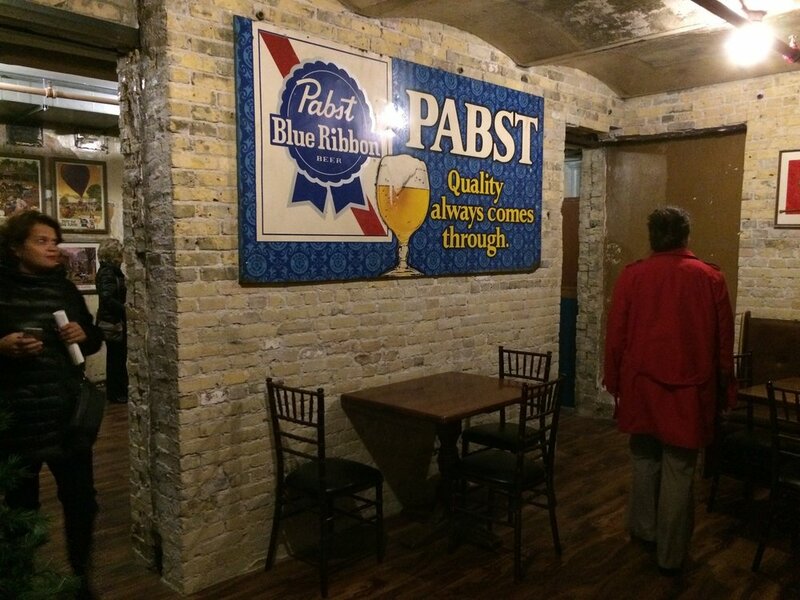 Then we all took a tour of some dark and dirty areas of the 1880 building, part of the sprawling former Pabst Brewery complex. 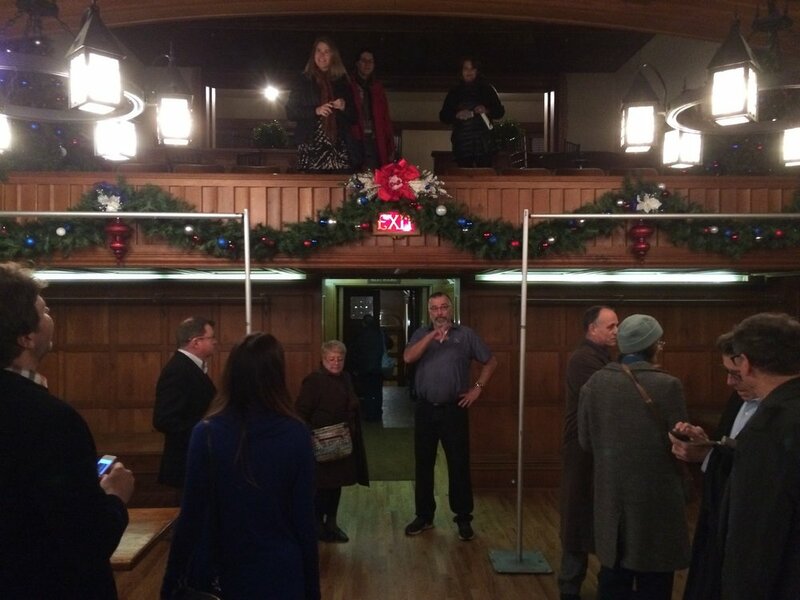 Jim Haertel and his team offer great "Beer History Tours" on a regular schedule. 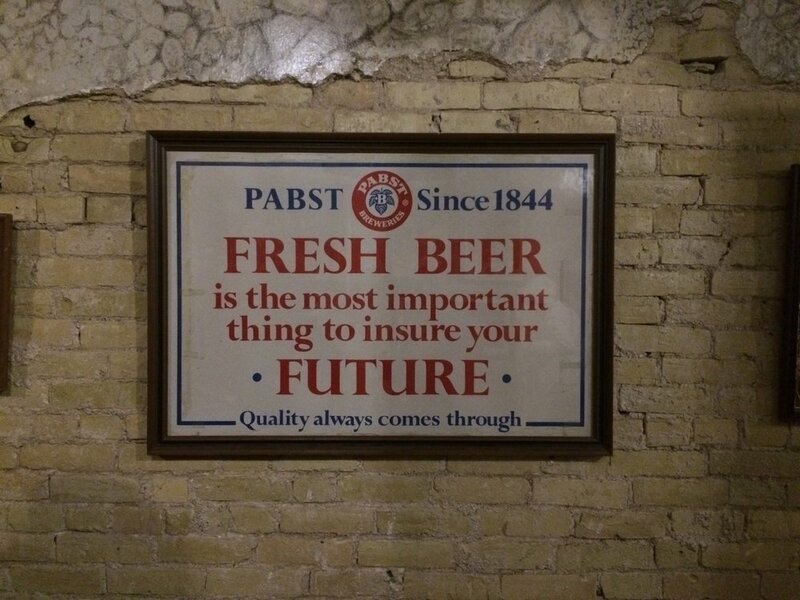 Best Place (named for brewery founder Jacob Best, the brewery was later purchased by Frederick Pabst), is a historic rehabilitation success story that was financed in large part with the state and federal Historic Tax Credit programs. Wisconsin recently increased the state credit from 5% to 20% of qualified rehabilitation expenditures. Haertel says the project would likely not have happened without the program. Now, Best Place is positioned to be a significant component in a complex of publicly accessible venues closely associated with Milwaukee's important brewing heritage. Here's an update on the Eschweiler Buildings for those following along with our posts. It seems that Milwaukee County acted improperly in the original sale of the Eschweiler buildings to the UWM Real Estate Foundation. The attorney for the WI Historical Society, Chip Brown, is now involved and has forwarded the issue to the Attorney General. The following is an excerpt from Fox 6 West Allis' coverage of the story. Click the link at the end of the clip for the complete story. A legal specialist for the Wisconsin Historical Society has notified the Attorney General's Office that he believes that the sale of the Eschweiler Campus Historic District by Milwaukee County to the UWM Real Estate Foundation violated state law. He went on to say because of that, Wauwatosa should deny any request to demolish any of the Eschweiler buildings — and that in one scenario, the violations could result in as drastic an action as vacating the original land sale. Chip Brown, an attorney and government assistance and training specialist, said the county failed to notify the state Historical Society of the sale of the historic property and failed to obtain a conservation easement to protect it.